In January 2013, when 24-year-old Kelsey McBride was laid off from her job as a publicist for a payday loan company in Beverly Hills, Calif., she knew there was one thing she wouldn't miss: the 90-minute commute in bumper-to-bumper Southern California traffic. But the regular paycheck? That she would miss. Fortunately, she had been doing occasional freelance projects on the side during her six months of employment, and she drew on the experience to begin setting herself up as a publicist for authors. She turned to Twitter to find clients, doing searches for "book release" and other key phrases, then emailing or tweeting at the authors to offer her services. For the first three months, she managed to land only three clients a month. But things have turned around. Now, she says she has 10 to 15 clients a month, and makes $4,000 to $6,000 in monthly income. McBride is part of a recent and still-growing trend of freelancers taking the ball from full-time workers. All over the U.S., companies are replacing full-time employees with independent contractors, and people who once counted on a steady income are being left to fend for themselves in a hyper-competitive freelance market. 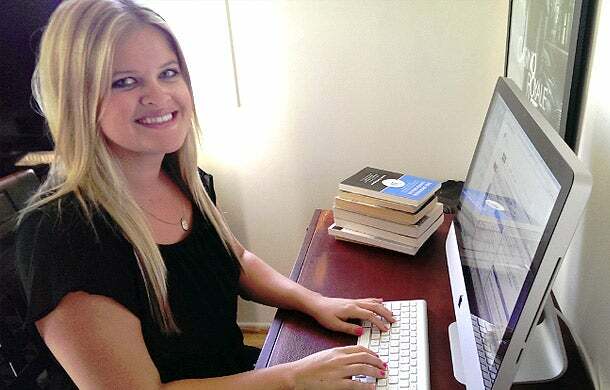 Kelsey McBride, 24, works in her home office in Beverly Hills, Calif. as an independent publicist for book authors. It's a market that is growing tremendously. There are nearly three million freelancers registered on Elance, the largest online platform for what Elance chief executive Fabio Rosati calls "fractional jobs," a term describing the result of full-time job functions being split into individual tasks performed by freelancers. More than 60 percent of mid-size corporations in the U.S. expect to hire more freelancers in the coming year, according to a study commissioned by Elance and conducted by independent consulting firm Tower Lane. Work has been moving online for years now, with Monster and other online job boards giving way to LinkedIn, and a host of digital tools making distance work ever more viable. To hear Elance's Rosati, tell it, Elance is merely "the next logical step, combining online matching and online work on a single platform where professionals can connect, collaborate and pay in real time." To be sure, some business owners welcome the trend. "Freelancing is awesome. It keeps costs down and lets you quickly test out an individual," Trey Smith, who runs San Diego, Calif.-based Kayabit Games, says. "For example, I can hire an artist for an hourly job and cancel the contract if it doesn't work out the first day. Doing this with a full-time, in-house employee is much more difficult." Smith says he has hired dozens of freelancers across various platforms for contract work, including Elance, Guru, Odesk and Vworker. About 60 percent of the independent workers he has hired live in America, while the rest hail from countries such as Ukraine, Pakistan, Singapore and Portgual. The U.S. has the greatest number of Elancers, with nearly 716,000. India is second, with more than 359,000; Pakistan is third, with more than 113,000; and the Philippines are fourth, with more than 89,000. Of the top four countries by number of Elancers, three are in the developing world. The top four hiring countries, by contrast, are the U.S., Australia, the U.K. and Canada, in that order. These numbers make it hard to escape the impression that the global market consists largely of First World employers hiring cheap Third World knowledge workers for fractional labor. "We serve the world," Rosati says, but adds that Elance has "evolved" over the past few years and now boasts a larger pool of sophisticated clients who are more concerned with quality than with price. According to Elance, the average hourly wage for U.S. freelancers using the company's platform was $28 during the second quarter of 2013. That represents a five-percent increase from the same period of the previous year. It's difficult to compare the freelance lifestyle to the work hours of full-time employees, but if one assumes 40 hours of billable work each week at $28 an hour, and two weeks of unpaid vacation, the freelancer would earn an annual income of $56,000. But in reality, freelance compensation is all over the map. At the high end of the market are the young professionals who find work through HourlyNerd, a startup whose investors include billionaire Mark Cuban. HourlyNerd limits its pool of freelancers to MBA students and graduates of the top 20 U.S. business schools. More than 1,000 MBAs have signed up so far, and they are averaging $20 to $50 an hour, according to co-founder Rob Biederman, a 27-year-old MBA student at Harvard Business School. But they are earning those rates only after enrolling in costly graduate-degree programs. A Harvard MBA costs more than $100,000 in tuition alone, though fellowships and other financial aid lessen this burden for many students. Meanwhile, full-time jobs for elite MBA grads at McKinsey & Company, Bain Capital, Boston Consulting Group and other top firms come with six-figure starting salaries. "No offense to them, but I am shocked at how low they price their time," Biederman says of the freelancers. Far lower on the food chain are freelancers who soak up busywork for business owners like Josh Feinkind. Feinkind sells designer fish tanks and high-end furniture for cats and dogs through his New York-based company RefinedKind Pet Products. He recently hired an Elancer for an SEO project. Usually, he awards projects to freelancers with high ratings, he says, but in this case he chose someone who was new to Elance and had yet to receive any rating at all. The determining factor? While other Americans were pricing the project at $500 a month, this Elancer priced it at $100 for three months. The Freelance Economy Is Booming. But Is It Good for Business? That was enough to warrant a phone interview, after which Feinkind decided to hire him. "If he was pricing it the same as the other guys, I would have gone with one of them," Feinkind admits. Such rock-bottom prices are de rigeur among freelancers in emerging economies such as Pakistan and Bangladesh. Feinkind has turned to Third World contractors for furniture blueprints, among other things. "Where I was paying $500 for factory drawings in the U.S., now I'm paying $50," he says. "For businesses, I think it's fantastic. I'm getting great work at a fraction of the cost [of American labor]." Indeed, cheap digital labor may be the largest growth segment of the freelance market in coming years. There were 30 million knowledge workers globally in 2012, according to a McKinsey report issued this year on "disruptive technologies." The same report predicts there will be two to three billion more people with access to the internet by 2025. Rosati says the trend toward contract work is accelerating, driven partly by the demographic calculus of global markets and partly by technology. "Technology is disaggregating the world of work much as iTunes did for music." Which begs the question: Disaggregating it from what? The answer would seem to be salaries, health insurance, paid sick time, and other benefits, though also, more positively, cubicles, department staff meetings, rigid schedules, bad or ineffectual bosses and annoying coworkers. So are Elance and other fractional-work platforms simply meeting, and capitalizing on, a need, or are they helping to drive the trend? Because Elance connects businesses that need specialized help on projects with professionals who can do the work, "[it] is disruptive to staffing firms and agencies, not traditional employment," Rosati says. But the platform's claim to being a "global meritocracy" rings less true after speaking with freelancers and business owners who say that knowledge labor is turning into a commodity, with price often the No. 1 consideration. In the future, other factors may further encourage outsourcing. In the U.S., a big one is Obamacare. Under the Affordable Care Act -- whose provisions affecting businesses are set to take effect in July 2014 -- a startup with at least 50 employees is required to provide health insurance coverage. There is a perception that this requirement will provoke companies to reduce some staff to part-time hours, or to rely on independent contractors rather than hiring more employees. Feinkind is the only full-time employee of his company. For everything he can't or doesn't want to do himself, he says, he draws from a global network of freelancers "a la carte and as I need it." Elance's annual report for 2013 is chock full of upbeat Elancer testimonials. But Rosati acknowledges that some freelancers "would prefer full-time employment if the right employment opportunity were available. For 'reluctant' freelancers, online fractional work is an important way to make money, meet potential employers and keep resumes current," he says. One of those freelancers is Feinkind's own fiancée. "If she weren't living with me, she would not be able to survive doing Elance," he says. He has suggested that she "go local," maybe holding seminars to teach social-media marketing and other skills to business owners in her community, rather than trying to compete with Third World workers in a global market. Despite seeing his fiancée's daily struggle to make a living, Feinkind continues to rely heavily on foreign contractors for his own business. He praises the outsourcing as saving both time and money, and justifies it by saying he can pass the savings on to his customers. "It's a great way to free up my time so I can concentrate on things that will really build my business that no one else can do," he says. "A lot of the people that use Elance are looking for really inexpensive work, mostly hiring people from India," says McBride of her own attempts to find work through the platform. And then, too, the authors tend to be of lesser ability -- often self-published writers who are not looking for a full-time publicist even on a short-term basis, she says. Instead, about 90 percent of her clients have come from Twitter. If you can find the right clients, freelancing does have its benefits, of course. In addition to the obvious -- a flexible schedule, the ability to work from home, low overhead and so on -- McBride says going into business for herself has taught her to take control of her personal finances. When she got paid as a full-time employee, "I would spend it all, because I knew that I would get another paycheck with that exact amount in another two week," she says. "Now I've learned to save a lot, because I don't know if all my clients will renew at the end of the month." What's more, she estimates that if she can maintain 15 clients a month, she will be able to hire an assistant to help her handle the work load. And with a solid 20 clients a month, she could rent office space and turn her freelance lifestyle into a full-time business with a staff of her own. For McBride, it's clear, freelancing is a way-station on the path to entrepreneurship. But even now, she prefers it to having a full-time job. I'm happier," she says. "I'm being challenged every day." Related: H-P Is Asking Telecommuters to Work On-Site. What Do You Think?